I’m sure everyone has heard the term “firewall” once or twice before. What is a windows firewall? Without a firewall, think of your front door to your house being wide open. People can come and go as they please and have access to all of your personal belongings. In the computer world your personal belongings are your banking information, credit card information, and your identity. Think of your windows firewall as a security system installed in your home. It will protect you from people coming and going – trying to get in to your PC and access your information. If you have an Internet Security Suite then you may find that you already have a firewall as part of the package, in which case it is not necessary to have the windows firewall turned on but if you don’t have an internet security suite the windows firewall is a great alternative. 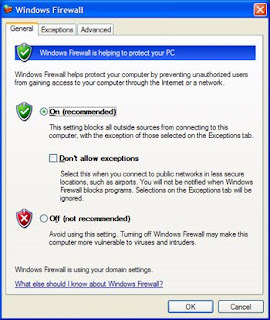 Ok now that you know this do you want to enable your firewall on your windows PC? 2. Click Run…->type in “control” and click ok. If you haven’t noticed you’re in the control panel right now. Alternately you can click control panel if it’s present on your start toolbar. 3. Scroll down until you see “Windows Firewall” and double click on it.